You've heard that an apple a day is good for you. 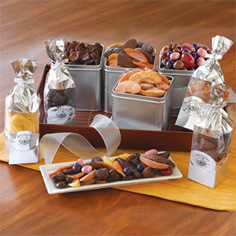 Well, that's almost beside the point when you taste this luscious assortment of perfectly dried apples and chocolate covered fruit. 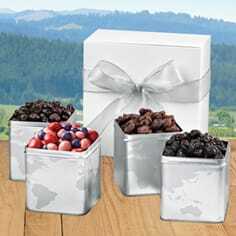 Each 12 oz tin in the Apple Dream 4-Tin Boxed Gift Set, holds one delicious variety of Cinnamon Fuji, Pink Lady® Granny Smith apple wedges; or Double-Dipped Chocolate Covered Fruit Mix. 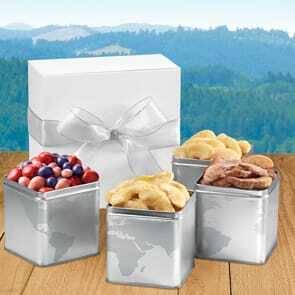 Gift boxed in our beautiful map tins. 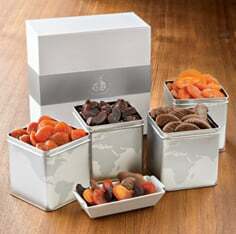 Also available as a 3-tin set without the Chocolate Fruit Mix. 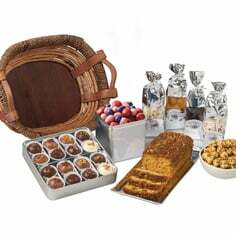 For even more chocolate gift sets take a moment to browse the entire selection at Meduri World Delights today.